The Gray Report: Would you buy a "bad vintage"? This week I have the honor of moderating a panel at the Unified Wine & Grape Symposium, California's biggest annual wine industry get-together. I'd like to tap your brain beforehand. The panel is called "How to Successfully Market Each Vintage, Despite the Weather." That's a polite way of saying, "How to sell wines from a vintage that certain publications have already trashed." 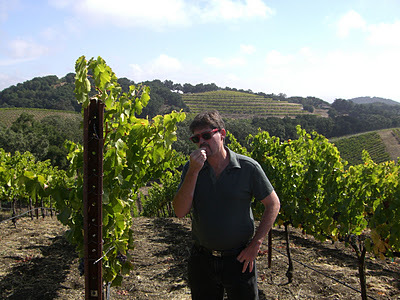 If you're wondering why they chose me, beyond my obvious physical charms, look no further than this post from last October titled "Hurray for California's 'bad' 2011 vintage!" My definition of a great wine is different from James Laube's (too soon to tell about Antonio Galloni). As the only media member of the panel, that will be my main point: that while Wine Spectator and Wine Advocate are influential, there's an entirely separate market today of sommeliers and consumers who disagree with the notion that bigger is better. I know they're out there. But how does a winery reach them? And is it more important to divide the market, or to counter the mainstream impression? Here's where you come in. The Gray Report has a great variety of readers, from inside the wine industry and out. I'd like to hear your take on this topic -- from any direction, whether you're a winemaker, sommelier, consumer or fellow wine writer. I will share your comments with the audience at the symposium. Feel free to add Sacramento dining tips. I get a per diem. In my experience, pouring in the tasting room, very few people paid attention to vintage. No offense, but they rarely read about wine - certainly nowhere near as much as many in the trade do. And at retail, most transactions move with the UPC on the bottle. When I started in the biz, I began changing the UPC for each vintage, but was quickly slapped by the sales guys when their accounts threatened to drop us for making them do extra work updating their system. Often I can dig back on a shelf and find another vintage of the same wine. So with grocery stores in particular, they don't seem interested in vintage. Jon: The UPC thing is great info, thanks. Unfortunately I know about people's wine-reading habits: It's usually a lot or nothing, with not much in between. This does bring up the question of whether news about a vintage even reaches people in the latter category. But somehow it did about the '98 vintage. I work in a tasting room from time to time up in Amador County. I don't think I've ever heard a customer ask or even comment on a specific year. Given that, and my other casual conversation regarding food and wine with co-workers, family and friends, it seems to me that to the masses are less concerned with vintage and more with "is this bottle of wine tasty". For those in the trade and for marketing purposes it seems this topic is a big deal (especially for 2010 and 11). But I still think for the average consumer heading out to Napa to have a good time the difference year to year is negligible. Dining options for Sac- Tuli Bistro is good. Closer by the convention center you should hit up Grange and Spataro is decent too. Consumers don't care about vintage, but distributors and retailers do. From my perspective, the denizens of the middle tier are looking for any reason they can latch on to to say "no" to the wine someone just poured for them - whether they like it or not. A vintage that gets trashed in the media is a bonus to them - they use bad press to beat up suppliers on price. Even if they like a particular wine, you hear things like "well your Coastal Pinot is going to be a tough sell because so-and-so said 2011 is a bad vintage" - even though so-and-so was writing about Napa Cab. But they might take a few cases off your hands if you offer a deeper discount. It's very hypocritical, because as comments above have noted, the vast majority of consumers aren't keeping score. John: That's very interesting perspective, especially because I know two members of our panel are chomping at the bit to point out that California is a big state with different microclimates. Also, that conditions supposedly "bad" for one grape might not be bad for another. How does one respond to these distributors? From my experience in sales (in Sacramento) buyers really don't pay that much attention to vintage except at high price points. The by the glass market doesn't care. If you lucky enough to be in the allocation aisle so to speak I would suggest using "off" vintages as a way for consumers to get "on the list" and guarantee future allotments. As to dining, Tuli is good but has a very limited menu and wine list. The Grange just changed chefs and Ihaven't been in since. Spataro is convenient and passable. I would check out Aioli (18th and L) for great tapas and some cool wines or Waterboy (where the other chefs in town eat) at 20th and Capitol and Mulvainies for fabulous food. All 3 three have very good wine lists. Who cares about wine. Go eat tapas at Aioli! I have often purchased wines from "off" vintages and been happy with the results. As I believe you pointed out, sometimes poor weather can lead to a longer growing season, less sugar and less jammy flavors. I do see that as a positive in some wines. Unfortunately for the wineries, bottles from challenged years may also be available at very attractive prices due to the mass perception that the wines will be of lesser quality. To me, however, the biggest issue with blanket declarations on vintages in California is that they over-generalize and don't take good viticulture and winemaking into account. To say that 20XX is a bad year for Napa wine, Paso Robles wine, etc. is to imply that all areas within those regions are alike. That is so far from being the truth it's ridiculous. It also suggests that growers don't know how to drop fruit or spray and that wineries don't have sorting tables or care about the quality of their product. And, unlike many wine growing regions elsewhere, most vineyards in California get enough warmth and sun to achieve reasonable ripeness even in a "bad" year. There is much more impact on production volume than on quality. Vintage variation certainly occurs here. And wineries without the resources to actively manage their vines and wines may suffer. However, the differences are not so great across the breadth of a region that consumers really need to be cautioned against a particular vintage as a whole. Andy here... Normally, I agree that there is very little generalizable vintage variation in California -- simply put, there are so many microclimates based upon elevation and proximity to the coast, and too many varietals planted in each microclimate to really make a one sized fits all assessment of a year (unlike France -- where vintage assessments have more validity IMO due to much less variability in these factors). BUT, I think 2011 is going to be an exception -- there was a lot of rot and a lot of underripe grapes(even by Mina standards). There still will be great wines made both in the typical and sommelier standards but I think even casual consumers are going to notice the difference by 2011 and other years. How does one sell wine from 2011? I'd say celebrate the good differences and either not make or discount the bad wine (and be honest in your self assessment of the good and bad). Vintages don't matter much to consumers unless we all cluck so loud they can't help but hear something (think 2008 Smoke Taint). And with the trade, vintage discussions are generally more about availability because everyone has learned that while conditions may have made it a difficult vintage, there will always be great lots of wine that emerge, just less of it. Our yields are literally cut in half recently, but the half that remains, well, you'll feel good about it when you try it. That makes it, challenging vintage...but...and the but's all that matters. In my view, lesser vintages give the wine consumer the opportunity to taste some of the better producers' wines at (hopefully) lower prices. Invariably, the better producers seem to produce good wine even in the lesser years. They are also more attractive in restaurants where mark-ups often preclude tasting the greater vintages. At least in my opinion. When I worked at Trader Joe's, no one within the company seemed to care about the vintage of the wines we'd bring in. Externally, the customers who were asking about such things were few and far between, perhaps one or two out of every 50. I can't ever remember getting a notification from our higher-ups that a vintage was changing. In Dundee, most of my tasting room guests don't ask about vintage either, they leave the question of good/bad/ugly to the media. The ratio is similar that of a grocery chain, one or two out of 50 actually asking specifically for or about a vintage. Once a proclamation is made though, that small minority does tend to blindly follow the dictates of whichever moron they choose to trust. Those are the dangerous types, the ones who actually buy into the marketing-created need to grade every vintage before the grapes are even done fermenting. Wine geeks like grading vintages too, but from what I've seen they tend to avoid making blanket statements (a la Parker) about a vintage's provenance. Then again they don't have anything to sell, be it magazines or wine. I can only speak for my own retail store but we taste new vintages as they come out and if we like the wine, we like the wine; it doesn't matter to us if it's from a "trashed" vintage. Overall, what critics and magazines write is an over generalization of a vintage and it does not matter to our customers, especially if we are successful in explaining to them the character of the wine and why we think it's great. There are always going to be those people that take what is said about a vintage as overarching gospel but those are generally the same people that won't touch a wine if it scored less than 90 points. A consistent theme of these comments and some of seen on Twitter is that low ratings on a vintage should mean lower prices for the wine. That sounds like a no-brainer, but I wonder how exactly that happens. Must wineries cut their wholesale prices? Should they? Is that good or bad business for the long term? I'm a consumer and I buy 90% CA wines. To me a "bad" vintage is a shopping opportunity, because even in bad years, somebody makes good wine. And usually the price will be lower. In Sacto, try Ella (1131 K St. at 12th). At the bar, they make EVERYthing from scratch. This is if you want a break from wine. I look forward to sitting in on the session! My personal opinion (covering sales for a small winery) is that it is easy to lower the price of wine but much harder to raise the price again after a "good" vintage. Everyone from distributors to retailers to consumers are happy when you lower the price. The only person that's really happy when the price is raised is the winery. Most of the time, the costs associated with producing the wine, from the vineyard to the winery, are the same, if not more, regardless of how good or bad the vintage is "rated". It's hard for a small winery to absorb costs because a particular vintage is declared to be bad. I agree with the other comments that the majority of consumers don't care as much, but I am interested to hear what advice the panel has for dealing with the trade buyers that do care. I agree with everyone else that for the most part consumers don't seem to care about vintage. Working in a tasting room in Napa, I do get the occasional requests for specific vintages. It seems to be the consumer with very little wine knowledge that usually asks about a certain vintage. For example, the visitor had the 2009 Moscato once and now they're in the retail shop buying the 2010 Moscato and worried they won't like that vintage. Then there's the visitor who comes in and hasn't even tasted our 2008's asking if we have any 2007's left. From my experience with the 2007 Vintage in Oregon I can say that consumers do care about vintage. Early reports about that vintage created a momentum that was very hard to overcome. Consumers consistently wanted to by pass the vintage and talk about the 2008's. The lesson I learned is that a region has to get thier story out first, before critics can torpedo the ship. Fast forward to 2011 in Oregon and we were looking at some terrifying conditions that if left to interpretation by critics not on the ground would have, no doubt, been considered disasterous. The Oregon Wine Board and many growers rallied together and agressively challenged any premature indications that the vintage was "Bad". As a result we were able to create a narrative of a vintage on the edge, dramatic to say the least, and in the end a success story. The story went from the "vintage that never was" to the "miracle". (For the record there are going to be some mind blowingly good wines). My advice; Stay unified as a region, respond quickly and honestly to negative indications, emphasize the virutues of the vintage (what's so bad about a 13.5% Napa Cab? ), don't let them see you sweat. I agree with John Kelley. There is often an interesting overlap between "bad" vintages and difficult market conditions. Think of the "bad" 1998 Napa Cabernets that arrived on the market at the same time as a minor recession, a grape glut and warehousing-stuffing 2000 Bordeaux. Or the "bad" 2007 Oregon Pinot Noirs hitting the warehouses at a time of intensive downtrading and near-paralysis of financial and distribution systems. Such vintage characterizations can be very convenient to trade buyers. My two cents is that the comments should be divided up between regions of the world that have vintages in the traditional sense and those that do not. I know that there have been variations in the past few years in California, but I would be willing to bet that the largest swings in vintage variation barely compare to the roller coasters the non "hot climate" regions experience. Vintages do matter only where vintages variation truly exist. did you ever hear of the '58 Chevy? What if the bad vintage that we just went threw is unpresidented in mordern day california winemaking for certain veritals? Could we look @ a heightened consumer awarness of california vintages? Say Cab from paso Robles in 2011 is a loss and worse than any one could have ever thought, with hundreds+ of tons being harvested @ under 20 brix. However, rhones and zin had a banner year especially for the producers that meticulously care for their crops? What if a vintage becaime a bigger problem with certain verietals than we ever could have imagined. That was the year we just went through down here in paso Robles. There was a very big new buyer who came to town and gobbled up any Cab that was avaliable for historic prices, but could they be left holding the bag. I hope so! So educate the public, tell them "the good the bad and the Ugly" and the truth will set them free! I'd like to offer the perspective of a non-insdusty, wine enthusiast. I am starting to build a collection, and my concern as a buyer rests with long-term aging potential. This puts me in the minority, as I know 95% of bottles purchased are consumed within a week. Fred Swan pointed out that an "off vintage" results from poor weather conditions, often requiring a longer growing season, producing less ripe grapes. This is not necessarily bad for the wines produced in that year. In fact, a wine with a lower ABV and higher acidity is exactly the formula for long-term aging. A chewy 15+% Zin will turn into an alcohol bomb in ten years. Jerry D. Murray referenced the 2007 Oregon Pinot vintage, widely derided by Parker's despotism. But I have found the '07 Willamette's to be far more Burgundian than any other vintage from this region. I enjoy the 08's for their opulence. They are fun to drink now. But I have a bottle of 07 Johan Vineyards that I have put in the cellar. I was married in 2007 and my wife and I will enjoy this bottle on our 10th anniversary. From my perspective as a retail buyer for a small, independent shop, I read the press but make my decisions based on what's in the glass in front of me. There are so many regions/producers/vintages to try to keep with that my poor brain can only hold so much, and what seems to be most important to my customer is what the wine actually tastes like. The ones that ask about specific vintages are generally the 'score whores' looking for trophy bottles to impress rather than bottles to suit their own tastes. BTW, in total comment drift, thanks for the dining tips, folks. I had dinner at Aioli -- pulpo gallego (octopus/potato) was great -- and lunch at Ella. Fine meals, I'd go back to either.